On November 15, 2018, I wrote an article titled: OPINION: THE GANG THAT CAN’T SHOOT STRAIGHT HAS NOT IMPROVED THEIR AIM. The “gang” is the Marshall City Commissioners and the “can’t shoot straight” refers to their inability to hire a city manager. Sadly, I must report that things are not improving. They are getting worse if that is possible. The Commissioners have been working on this for eight months. Their first attempt failed completely, and they started over. Based on what I have been finding out, their second attempt may be headed for another failure. If this happens it will be completely the fault of these Commissioners. Of course, the City Commission has chosen to not keep the public informed on their progress. Why let the citizens know what is happening? I have learned that the Commission met on November 14 and narrowed the list of candidates and agreed to hold interviews. It is all good but now the bad part. They agreed to hold interviews on December 3. This is still good, BUT the Commissioners decided not to interview all the candidates the same day. I can only assume that they did this because some of the Commissioners don’t have the endurance to work a full day. So, the Commissioners had to select a second day for interviews. Because of the commissioners’ busy schedules, the next day they can hold interviews is December 12. This means that is going to take these Commissioners one month to interview 4 to 6 people. The clock is ticking. The City Commission should act quickly and the person that can make that happen is Mayor Hurta. In bridge they say, “he who hesitates is lost.” The same thing can be said for hiring a city manager. First, treat hiring a new city manager as the most important thing you have to do in your life until you complete the mission and hire a new city manager. Based on the timelines this City Commission has not done things in a timely manner. There are no excuses for the long delays. They can only be explained as lack of interest on the part of at least some City Commissioners. Every day that the Commissioners delay hiring a new city manager is one more day that a good candidate might slip away. If a candidate is applying to Marshall, they are most likely applying to other cities. Those cities might have an effective City Commission, unlike Marshall, and hire the person that would have been a prefect fit for Marshall. Every day we delay hiring a new city manager is one day too long. 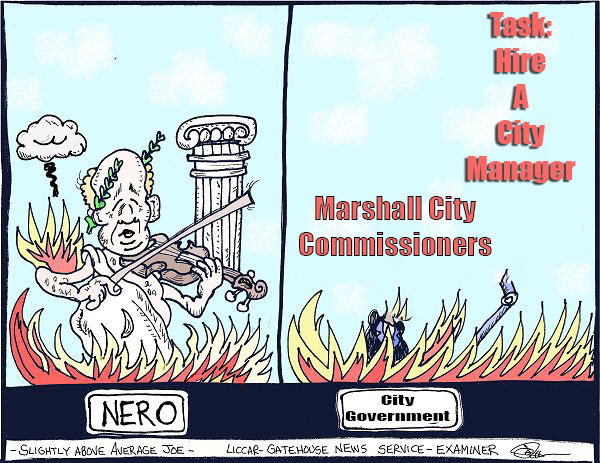 Nero fiddled while Rome burned – The Marshall City Commission delays while good candidates get away.